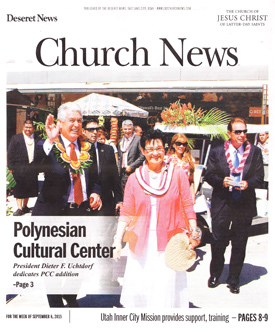 President Dieter F. Uchtdorf, second counselor in the First Presidency, dedicated a major new addition to the Church-affiliated Polynesian Cultural Center here on Aug. 29, after which he dedicated the new Courtyard by Marriott hotel on Church-owned property adjacent to the center. 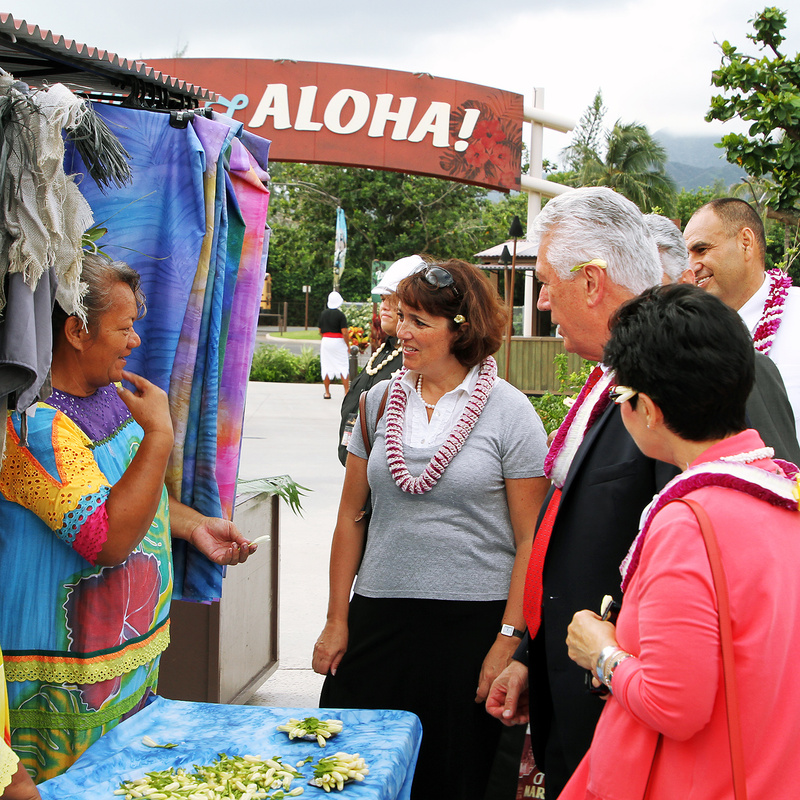 Speaking from the new Hukilau Marketplace at the PCC, President Uchtdorf recalled he and his wife, Harriet, who accompanied him, first visted the attraction in 1976, and have enjoyed it ever since. 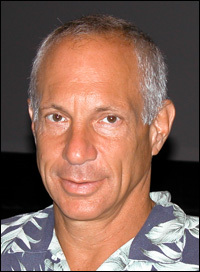 “Your friendship, your kindness, your openness, your spirit of aloha is really what makes the difference,” he said. President Uchtdorf was also accompanied to Hawaii by President Kim B. Clark of the Seventy, who is Commissioner of the Church Educational Sysgtem, and his wife, Susan; and Bishop Gérald K. Caussé, first counselor in the Presiding Bishopric and his wife, Valérie. 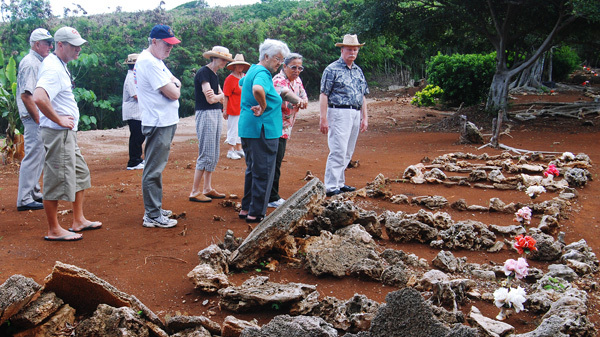 About three dozen people, including kupuna, gained new appreciation for the aloha of families and volunteers during the Mormon Pacific Historical Society’s (MPHS) November 24, 2007, tour of five small and previously completely overgrown cemeteries in Laie. 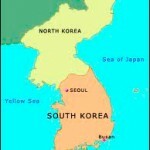 In fact, many community residents are still not aware of at least three of the five cemeteries, which have all been partially restored. 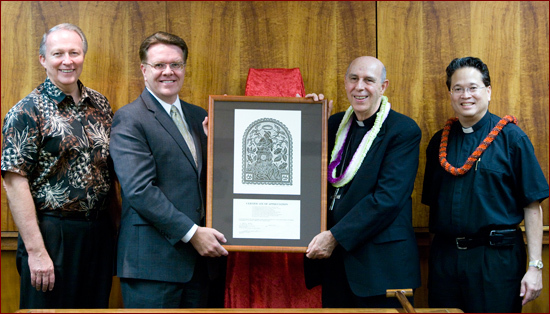 LAIE, Hawaii — The Most Reverend Clarence “Larry” Silva, Bishop of the Roman Catholic Diocese of Honolulu, presented the Polynesian Cultural Center and The Church of Jesus Christ of Latter-day Saints in Hawaii with a special Certificate of Appreciation on May 7, 2010, “in gratitude for the collaboration” of Jonathan Napela and St. Damien of Molokai, for their service to Hansen’s Disease patients at Kalaupapa in the 1870s. 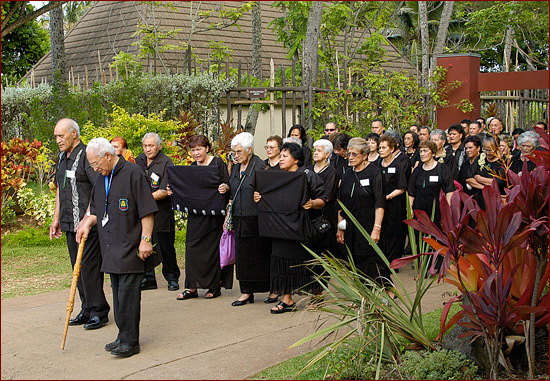 Bishop Silva explained that though the two men belonged to different churches, they worked closely together at the isolated Kalaupapa leprosy or Hansen’s Disease quarantine settlement, and the Catholic priest once described N?pela as his “yoke-mate.” Largely for his work there from 1873-1889, Pope Benedict XVI enrolled Father Damien in the canon of Roman Catholic Saints on October 11, 2009, at St. Peter’s Basilica in Rome. 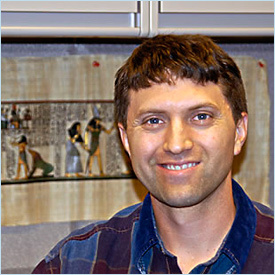 Dr. Ethan Yorgason [pictured at right: photo by Mike Foley], an adjunct assistant professor in the history and International Cultural Studies geography professor at BYU-Hawaii, contributed a chapter on the “shifting role of Latter-day Saints as the quintessential American religion” to a recently published scholarly three-volume work entitled Faith in America. Yorgason explains the word “quintessential,” as in “the quintessential American religion,” refers to Greek and medieval philosophical beliefs in “aether, the fifth element of the universe along with fire, earth, air and water.” He asks: “Could this label, like aether, become more of a reminder how people used to think than a notion that provides insight” and begins to explore if the label will have “staying power” for Mormonism into the twenty-first century. 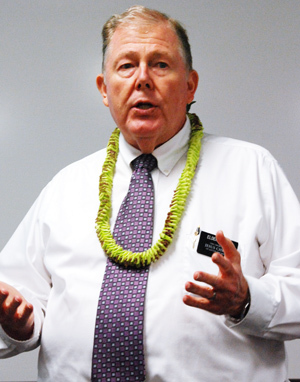 In his third and final BYU-Hawaii Joseph Smith Lecture Series presentation on April 1 in the Aloha Center, S. Michael Wilcox [pictured at right; photo by Mike Foley], a visiting instructor from the Salt Lake Institute of Religion at the University of Utah, taught that the modern equivalent of an anti-Christ is anyone who would trouble or shake a person’s faith. 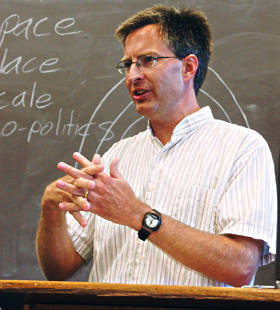 In addition, he taught how the Book of Mormon provides lessons on resisting such attempts, and clarified a number of metaphors relating to the faith and testimony required to do so. 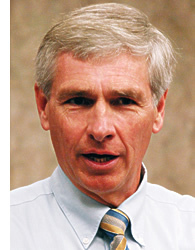 Wilcox — who is also an author and frequent BYU Education Week speaker — pointed out that when Mormon compiled the Book of Mormon, “he had in mind challenges that you and I in our world were going to face,” and that these included four incidents of antichrists. 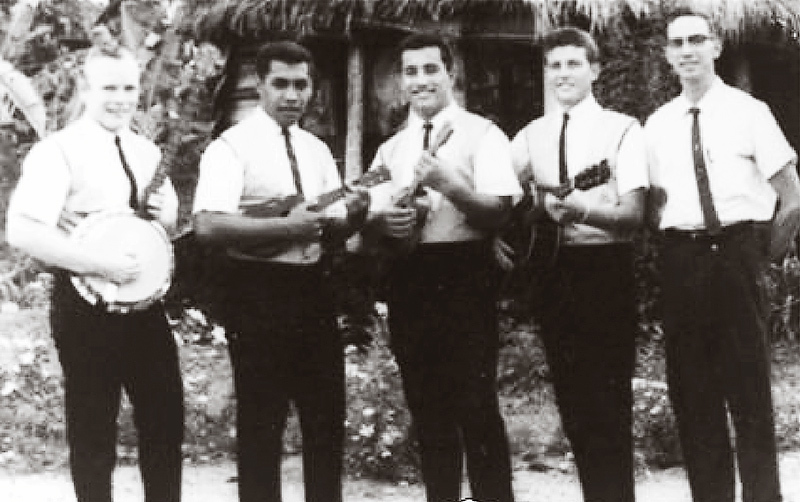 In the summer of 1963 the late Wendell B. Mendenhall, president of all LDS labor missionaries in the Pacific, asked 148 New Zealand Maori to help get the Polynesian Cultural Center ready for its opening on October 12th that year. The group, all volunteers who paid their own expenses, stayed for six weeks and not only put the finishing touches on the Center, but also dominated the PCC’s first night show with their lively action songs and beautiful harmony. 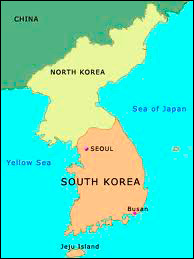 They also put on concerts in California and Utah before returning home. 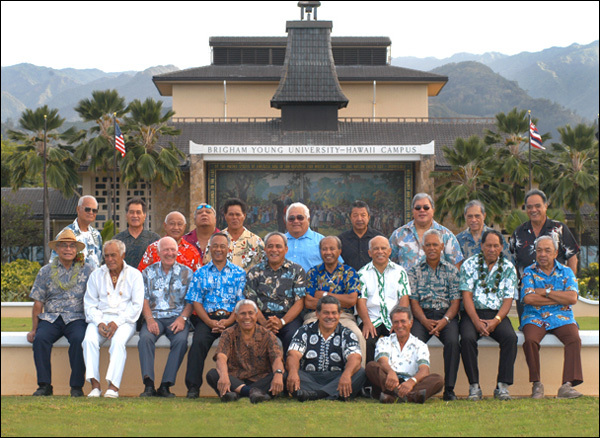 On Aug. 5, 2005, 48 surviving members returned to PCC for the first time as a group to participate in the Whakataetae festival. 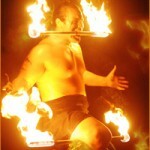 In accordance with Maori custom, PCC villagers and Maori community members welcomed them and the other Whakataetae visitors with chants, a wero challenge, speeches, songs and hongi [nose pressing] greetings. 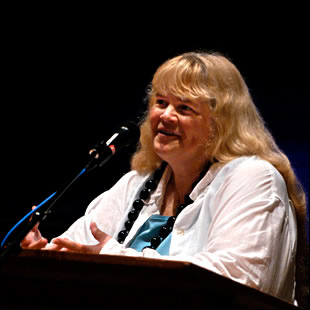 Cheryl LaMont [pictured at right], President and CEO of Dot C Software — a Kailua, Hawaii business that does photorealistic 3D computer generated imagery (cgi) for Hollywood and other major clients around the world — urged students interested in computerized animation and other film effects in the March 29 School of Business Entrepreneurship Lecture to pursue their dreams. “It’s always a privilege to speak to students who are interested in film-quality software,” said LaMont, who added her company has developed proprietary software that renders three-dimensional effects for well-known industry giants Dreamworks, Sony and others, and has done work on films such as The Matrix and Jurassic Park. 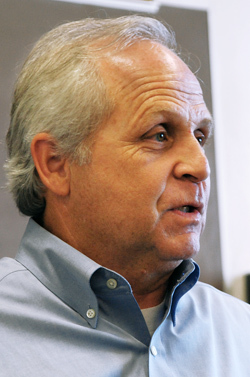 A prominent sports marketing and event management businessman took time on October 1st from a nearby professional golf tournament to advise BYU-Hawaii School of Business students on practical aspects of entrepreneurship.